Found a resource today that follows up our look at the rights of prisoners as patrons. They provide links to national sources to prisoners and their rights. It does not focus specifically on the prison library and is sponsored by Find Law’s commercial site. Guantanamo Bay. This facility is considered illegal to some and to others a necessity. It may come as a surprise to some that they have a library. How are prisoners’ rights different in this facility compared to other facilities? The answer is that “The US military says the detainees at Guantanamo Bay have no legal rights under American law” (Guantanamo Bay Library). While the reigning law is that prisoners have no rights, several organizations do not agree. The full resolution can be found in their newsletter archives. For a further glimpse into this institution’s rules of prisoner communication to the outside world…. Prisoners wrote poems and sent them to their pro bono lawyer, Marc Falkoff, because it was the only communication they were allowed. Falkoff found himself with a collection of work from his clients and had a selection of these poems approved by the Pentagon (each line needed to get an okay) to be published in Poems from Guantanamo: The Detainees Speak. This institution’s library work is intriguing. In the next week or so, I’ll post more about Guantanamo and it’s library. Falkoff, Marc. Poems from Guantanamo: The Detainees Speak. Iowa City: Iowa City Press, 2007. 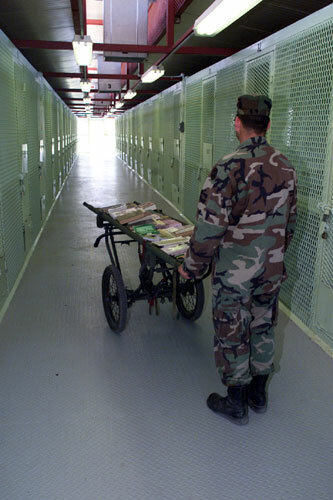 Guantanamo Bay’s Library. Aug. 26, 2009. PRI’s The World.